I'd copy this, but I'm afraid you'll send your patent lawyers after me. Clever idea. Did you drill out the speedsquare for the dog? Also, have you checked the squareness? I know the speedsquares I have are all off just a hair. The only cheap square I have that's actually 90 is one of those swanson slide squares. Don't forget the cost of the rail dog and square. I have a 12" aluminum square (mine by Empire but Swanson makes one also) and found that it wasn't giving good results, depending on which of the three surfaces on the base leg were used. I took it to a local machine shop and had them take a light cut on all four surfaces to true it up. Business was slow so they charged me a whole $25 to put it on a milling machine and true it up, and included a demo on their CMM (coordinate measuring machine) of the results for me. If I'd realized how good a deal that was, I'd have run down to Lowes/HD and picked up a couple more. Photos show me checking the finished part against my Woodpeckers' square, last two with the inside faces hooked onto the machined edge of the table saw. Not pouring cold water on any idea, but trying to use a shop-made rafter's square based jig to achieve the same precision result of the TSO's GRS may not be realistic. The Empire brand squares (combo squares, rafter's squares or speed squares) are particularly notorious for their out-of-squareness. They are a hit-or-miss because they are carpentry tools, not woodworking tools. Someone has posted a youtube video using the 4 cuts (5 cuts?) method to show how accurate/square the TSO GRS cutting result was. It would be nice if someone who uses the speed square shop solution would do a similar test and share the result. the 7.5" Empire speed square has the hole in the right spot to do this and fits perfectly under the rail. Of course, you need to check for square like any jig before you tighten it up, you don't need the rail dog, in fact, any t-nut would be better, that's just what I had on hand. I'm confident I can get the accuracy of a GRS with this setup. your result may vary "its poor craftsman who blames his tool" what I'm saying is: at $250 the GRS is vastly overpriced. "Over priced" I think not. The cost of precision gets in the way of economy. How much do you save in terms of money , checking and validating the inexpensive option? IMHO would argue you are looking at it from a false economy. While it is cleaver to integrate an existing framing square as an option. I would not assume that the framing square is the equal to the GRS. However if you find that the precision the framing square is giving you than that is fantastic. No dog in the fight as I no longer own a track saw, so neither the shop-made solution or the commercial product would be used in my shop. I have been making comments from an accuracy point of view. Any good shop solution in my view should stand the test of time, or in this case, the test of consistent squareness. The commercial product, at least based on one tolerance test (youtube) and numerous user feedback, does provide square results in a consistent and repetitive manner. Checking and validating a tool or machine every time before it can be expected or assured to deliver a good result is something many woodworkers want to avoid. That's also partly why people want to own a cabinet saw rather than a contractor or jobsite saw. Every time I cut something on my cabinet saw, I am 100% sure that the cut I am going to get is the same as the last cut I made a few days ago, or a few weeks ago. No checking and no validating at the beginning of any cut, and most importantly, there is no unexpected variance in the performance of the machine. To me, that's worth the difference in price between a top-end cabinet saw, and the contractor saw I used to struggle with. One can not stress enough efficient workflow. The time vampire that constant metrics calibration takes can not be overlooked. While validation and maintaining calibration is a necessity, The need for constant validation should be avoided. What is also overlooked is simple fact. Tools or machines that need constant calibration increase the possibilities of missing your desired tolerance. As the quality of your work increases this becomes less acceptable. Modeller- that’s a pretty sweet cabinet line you’ve produced. Nice work. If the Empire works for your business, I’m sure it’s pretty functional. Thanks for the tip- as a Mafell/Bosch rail user, it’s good to see and option that might work for those rails. I’ve made a few squares up, and they’re pretty close to being perfectly square, and certainly closer than some squares I’ve paid good money for. However, I bought the TSO GR-16 and GR-16 PE set in a systainer, no they’re not cheap but, they are bang on square, and turn a guide rail into a large square very quickly, and easily. No messing, just take out of the box, clip or screw to the rail and away! I’m a very much each to their own sort, and a few times, like many others, I thought I’m sure there must be a cheap and easy way to set up for square cuts, and there are ways. It’s whatever we’re comfortable with, nowadays I’m very comfortable using the TSO squares. Is this what it looks like? 4mm thick walnut veneer? I’d like to know about that. @modeller, I have to compliment you on your work. It speaks for itself. Inspired by your results, I checked my own speed squares. I have three. All of them cheap ones from the borg. I just can't see it--at least for me. All three were off. When I tried it with the worst, I was off by almost 2mm over 300mm. And the other two were off by about 1mm over 300mm. It certainly could be due to my error, or maybe even due to misuse. At the moment, I think think they might be suitable for rough carpentry. Maybe. I suppose I could have them machined to improve results. Or even attempt to correct them myself. But I think for now I'll stick with TSO for cabinetmaking. That Columbia Classic Core ply is really fine looking stuff! Even better than the MDO I was raving about in another thread. I’ll be looking for that in the future. 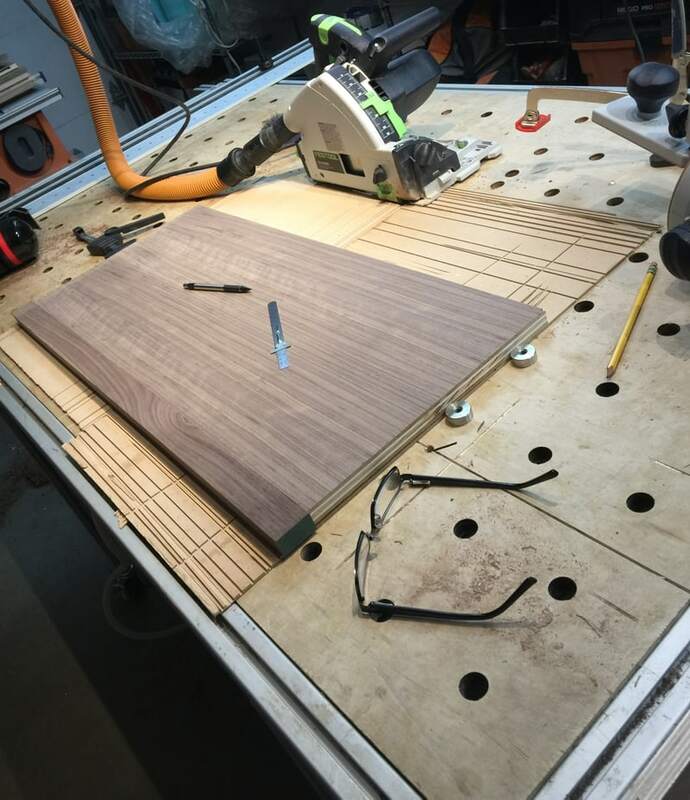 What got my attention in the photo from your site is that the outer layers of mdf are the same color as the walnut veneer so it looks like the veneer is very thick.